This is one of the saddest photos ever. This is Paddy, our friend’s cat. 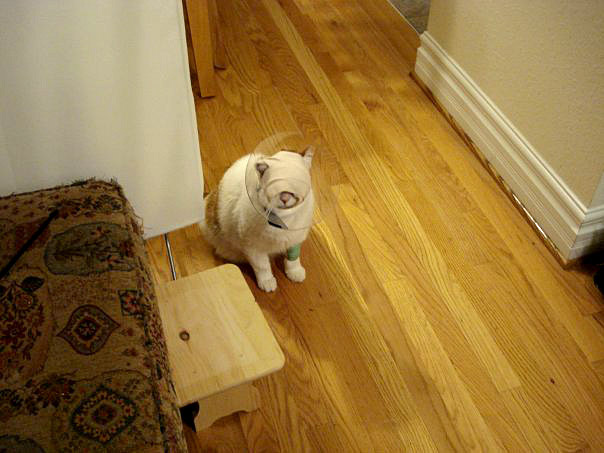 Paddy went blind in one eye, and then had it removed. Paddy then went blind in the other eye, and had that one removed. I’ve shared this sentiment with Paddy’s owner, and it’s all good. So find sadness, but also find happiness. Good Luck Paddy… Hang in There! Posted on Wednesday, January 27th, 2010 at 11:13 pm. Subscribe to the comments feed. Both comments and pings are currently closed. Post on your own blog. How incredible though that the owners instead of putting Paddy to sleep have done everything they can to make him comfortable.